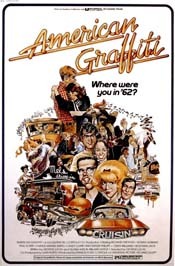 There's a scene in George Lucas' American Graffiti which few people could ever forget. Curt (a very young Richard Dreyfuss) stumbles into the clutches of a street gang called the Pharaohs. Assuming Curt wants nothing more out of life than to become a Pharaoh, he is offered the chance to prove himself worthy. The group drives past Jerry's Cherries, a used car lot located in the first block of Petaluma Blvd. North, and notices a police car in the shadows watching for speeders. The Pharaohs park and Curt sneaks behind the police car. He attaches a cable to the car's rear axle and anchors the other end of the cable to the ground. When the police car later charges out of the lot in pursuit of the Pharaohs, the rear end of the '62 Ford police cruiser is suddenly ripped from the car, giving the Pharaohs yet another night's thrill.